SatSun football, Wednesday Midweek Messis, Holiday Hat-tricks, Player Development Programme and Miss Kickers are our community football programmes for kids aged 3 -13 years. We learn new skills and game play in a safe, inclusive and fun environment. For kids interested in joining Spartans Youth Section our community programmes are the pathway into the club. A friend whose wee boy started with SatSun Football and who now plays with Spartans Youth Section recommended SatSun for my kids. The boys joined "Little Dribblers" in August 2015 when they were just 3 years old. I remember having to join in on the sessions with them until they built up their confidence. In fact, one of my most memorable moments was the day that they didn't want me to be there any more and were confident to take part alone. Coach Nic and her staff are brilliant with them: warm and engaging and keeping them interested and busy with lots of fun drills. It's great to have a regular local outdoor activity in a community organisation with fantastic facilities. My wife and I love seeing them really enjoy their football - running around for an hour with a smile on their faces, building confidence as they meet new people and learn new things. We've loved watching how their skills have developed over the past 3 years. 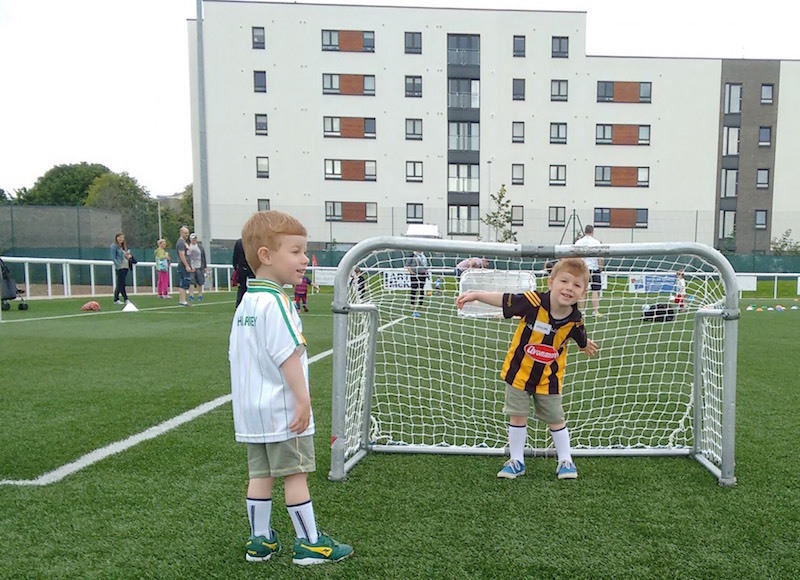 Calum and Rory both love a Saturday morning playing on the cool pitch with cool nets and meeting their friends. A trip to the cafe for a bun or a roll rounds off the morning! "I like learning new skills and playing matches at the end of each session." "I like playing with my friends." "You can see that it's a hub for the local community. It's welcoming, friendly and very well organised. It's a really positive environment for the SatSun kids and we love catching up with the other parents each week." You can find out more about our community coaching programmes here. The Spartans Community Football Academy is a social enterprise. When you support our football coaching programmes, you are helping us to change lives in North Edinburgh. You can also support us by donating here. The Academy has a range of term time and holiday football coaching programmes for boys and girls aged 3 to 13 years.